Tuberculosis (TB) is still considered a priority public health problem in the country, despite the progress in TB detection case rate and achieving a high treatment success rate of more than 90 per cent. Around 1,000 TB cases are detected in the country every year. About 70 cases are Multi-drug-resistant tuberculosis (MDR-TB). “Just like any other antibiotics, tuberculosis medication can also develop resistance especially if the patient is careless with the medication,” Dr Gaki Nima, the Chest Specialist of the National Referral Hospital, said. According to the Global TB report 2017, about 10.4 million people fall ill with TB globally. TB is most prevalent among the productive age group of 15-44 years. Continuous efforts are being made to end TB by 2030. Health ministry says with new technology such as Gen Xpert machine TB detection has become easier. “In the past health centres have been diagnosing using sputum microscopy which is only 70 to 80% sensitivity. There used to be more chances of missing the cases. Now with the advance in technology, we have such technology in Bhutan and we are doing better,” Rixin Jamtsho, the Chief Program Officer of Health Ministry, said. TB patients said people are still ignorant about the disease. “I urge the people to come forward and avail themselves of TB screening and checkups in the nearest health centres,” Pema Lotay, a TB Patient, said. World TB Day is observed on March 24 every year with the aim to create awareness, inform and educate the general public on TB. 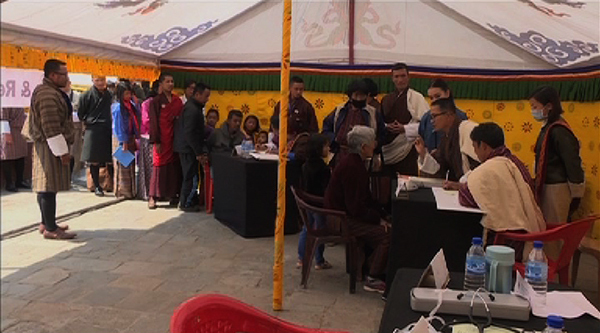 In Thimphu, the day was observed at the clock tower square with a free TB screening for the public.